An aggressive strategy by the United States to deter thousands of people fleeing violence in Mexico and Central America includes keeping women and children in detention for months while they await asylum hearings. Following a peak in arrivals last year of children and families, mostly from Guatemala, Honduras and El Salvador, President Barack Obama’s administration was under pressure to introduce tough measures to stem the flow. As well as beefing up border controls and expediting deportations, the response has included expanding the use of family detention. Figures from the last six months showing that the number of people caught at the border has fallen 28 percent compared to the same period last year suggest these strategies are working, even if there is no indication that the domestic and gang-related violence spurring people to flee has abated. Aracelli Bonilla Escobar, 36, fled an abusive husband and death threats from a gang in Honduras with her teenage daughter in March 2014, only to spend eight months in the state-run Berks County family detention centre in Pennsylvania. Prior to that she was held for six days at a border detention centre in McAllen, Texas, where she claimed that she and other inmates had to drink water from a toilet and were given only one sandwich a day. A surge in domestic violence is another major trigger of the exodus of women and children from the country, say lawyers. In Honduras, femicide has increased 260 percent in the past eight years. “The father of my child beat me so badly I ended up in hospital,” said Escobar. The use of family detention was largely abolished in 2009 following the closure of the T Don Hutto Residential Centre in Texas after it became mired in controversy. It emerged that children held there had been forced to wear prison uniforms and sleep with the lights on. This left the small facility in Berks County as the only remaining family detention centre in the country. Now, after the Obama administration’s move to expand family detention, the Berks County facility is doubling its capacity from 100 to 200 beds, and two new privately-run family detention centres have opened in Texas: one in Karnes City and another in Dilley, which plans to expand this month from 480 to 2,400 beds. Lawyers and activists are trying to shut the new facilities down and bring an end to family detention altogether, arguing that it is inhumane to incarcerate children awaiting asylum hearings. 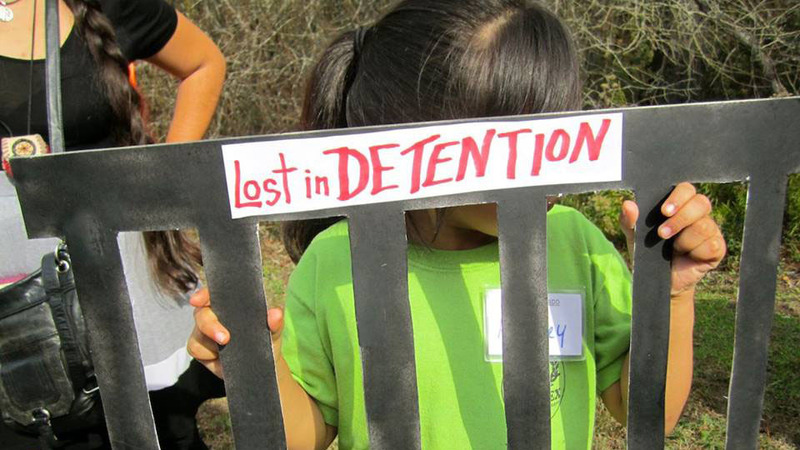 A demonstration is planned outside Dilley on 2 May and mothers at Karnes, some of whom have been in detention since June 2014, embarked on two hunger strikes in April to demand their release. The decisive blow to family detention could be a tentative ruling made by a US district judge in California on 23 April, stating that mothers and their children should not be held in unlicensed, secure facilities. The ruling compels government and immigration lawyers to negotiate an agreement on family detention in 30 days. Lawyers believe that Dilley and Karnes, which are both unlicensed, secure facilities, could now be forced to close. There is speculation too about the fate of Berks, which state officials argue is not a secure facility and should therefore be allowed to continue being used to detain families. Lawyer Bridget Cambria, whose firm in Reading, Pennsylvania, has taken on many asylum cases at Berks, told IRIN the argument by officials that Berks is not secure and that women and children are free to leave is blatantly untrue. “If they did try to leave they would be stopped. Guards monitor the doors and there are key locks on each of them.” Cambria added that families have been detained there for prolonged periods of time – some in excess of 13 months. My girl didn't understand what was going on. Being locked up, we felt desperate. Mayra Cifuentes Cruz, a 20-year-old single mother of two young children from Guatemala, was held at Berks for six months last year. She said being held with her children, one of whom is deaf and mute, was very stressful. “My girl didn’t understand what was going on. Being locked up, we felt desperate,” she told IRIN. Cruz, an indigenous Mayan, initially fled Huehuetenango for the United States in December 2013 after being attacked and hounded off her land by a wealthy landowner. Although she told border officials she feared for her life, she was not granted a so-called “credible fear” interview and was deported back to Guatemala. Such interviews are supposed to be used to determine whether an individual has a “credible fear” of persecution or torture back home that would make them eligible to apply for asylum. But Jackie Kline, Cambria’s colleague, said many of their Central American clients have no knowledge of the asylum process and are deported without being interviewed. Once deported, the door to asylum is forever closed and a “withholding of removal” status is the best they can hope for, although their children are still eligible for asylum. The attacks on Cruz continued in Guatemala, and she returned to the United States in June 2014. After their time in detention, her children were granted asylum, but she was given “withholding of removal” status only, because of her earlier deportation. The status allows her to work but disqualifies her from getting citizenship or travelling. Because Escobar had illegally entered the United States before, she was also ineligible for asylum and was eventually given “withholding of removal” status. Lawyers argue that most of the women and children fleeing gang and domestic violence in Central America are not evading detection when they are apprehended at the border. “When they arrive they are looking for someone to help them because of the humanitarian nature of their flight,” Greg Chen from the American Immigration Lawyers Association told IRIN. Most are found to have credible fear when lawyers have intervened on their behalf, he added. Advocates for an end to family detention point out that the women and children pose little flight risk and could stay with relatives or in shelters, pending their asylum hearings, at a much lower cost to taxpayers. Unaccompanied children, who fall under the jurisdiction of the Department of Health and Human Services rather than the Department of Homeland Security, are already housed in special shelters or foster homes. “The government has now decided that they can detain children as long as they are with their parents. Instead of finding alternative ways, they have expanded family detention,” said KIine. Watch IRIN film: Desperate Journey - American Odysseys about Central Americans' dangerous journey across the US-Mexico border.